I didn’t want a hot meal, but I also did not want a cold meal. Between Big D and I we came up with this flavorful, crispy concoction. The vegetables are either raw or cooked just until warmed up – maximizing the nutritional potential of them all. A perfect match for shrimp, which needs very little cooking to be ready to eat. The spiciness made us feel full pretty quickly. No lead belly after this meal! We were excited about our find at the store – big, fresh shrimp calling to us. Our past is filled with Gulf Coast shrimp by the bowl full. We grew up sitting at dinners filled with peel-and-eat shrimp dipped in spicy horseradish cocktail sauce, complimented by boiled corn on the cob and new potatoes. For this dish it was Little B’s first attempt at peeling raw shrimp. The first one was pretty mangled, but serious improvement on the subsequent little shrimpies. You should see her peel an onion these days – masterful! Heat two Tablespoons of the oil in large skillet over medium high heat. Add chili flakes and let sizzle for a few minutes. Add garlic, onion, bell pepper and jalapeno. Saute until onions begin to sweat. Sprinkle in turmeric, cumin, cinnamon and salt, and toss until vegetables are coated. Add cauliflower and cook a few more minutes until it begins to sweat. Add shrimp and toss. Place tomatoes on top of mixture. Cover skillet and cook for about five minutes, until shrimp are cooked and pink. On serving plates spread ½ – ¾ cup cabbage. 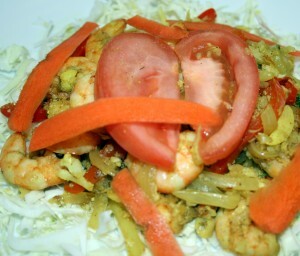 Add 1 – 2 cups shrimp and vegetable mixture, then top with carrot strips. Serve immediately. Now this – this is easy and delish! We love cabbage. And not just because it is low in carbohydrates and high in fiber, but because it tastes good, has great texture and marries up with a variety of flavors. It can double the bulk of a meat dish, or fill up the crevices of a stuffed pepper. It can also make a raw salad extra crunchy. Once when we were living in New Orleans I picked up a big head of green cabbage at a farmers market. All the heads looked pretty much the same, but I grabbed one of the smaller ones. Little B was a baby at the time, hanging around in a sling, nestled against me dozing on and off. I was tired from all the baby maintenance. When I got home and started cleaning and trimming the cabbage, it was filling up my sink. I was pretty impressed at the size. It was huge! Filled the sink. We ate on it for a week. Unlike Charlie of the Chocolate Factory, I never had to rely on cabbage water for dinner. I love the stuff. Roasting it in the oven brings out the flavor without getting watery. It is easy to cook up while something is finishing up on the grill. Enjoy! Preheat oven to 375F. Cut the cabbage head in half, leaving the stem attached. Out of each half cut a 1” slice. Trim some of the stem out of the slices, but leave enough to help hold the slices together. Set aside the outer slices for another use. In medium rectangular baking dish drizzle 1 Tbsp of the oil. Sprinkle the garlic and ginger, as well as some salt and pepper over the oil in a shape approximate to the circumference of the cabbage slices. Place the slices in the pan, gently pressing down so the spices are pushed into the cabbage. Sprinkle the remaining oil on the top of the slices, along with more salt and pepper. Bake for about 30 minutes, then flip the slices. Bake for 30 more minutes, or until cabbage is softened to preferred tenderness. Serve immediately. Preheat oven to 400F. Make one slit in each pepper lengthwise. Remove seeds and membrane from inside, careful to leave the stem attached to the pepper. Sprinkle inside of each pepper with salt. In blender or food processor combine tomatoes, oregano, cumin and a dash each of salt and pepper. Puree until you have a smooth tomato sauce. Set aside. Divide cream cheese into four pieces. With the back of your spoon (or your fingers if you don’t mind a little mess) spread the cream cheese around in the cavity off the pepper. In a medium bowl combine the meat and cabbage. Stuff the meat and cabbage mixture in the pepper, making sure the slit does not tear open any more than necessary. Top the meat and cabbage the tomato sauce, making sure it drizzles down within the pepper. Top with the cheese, tucking it in under the edges of the peppers, then gently pushing the pepper edges together as far as you can. In a baking dish just big enough to hold the peppers (9×9 or 8×11) pour in the water, then add the peppers. Cover loosely with foil and bake for 20 minutes. Remove foil and bake for 20-30 more minutes, until cheese begins to brown. Remove from oven and let cool for about five minutes before serving. 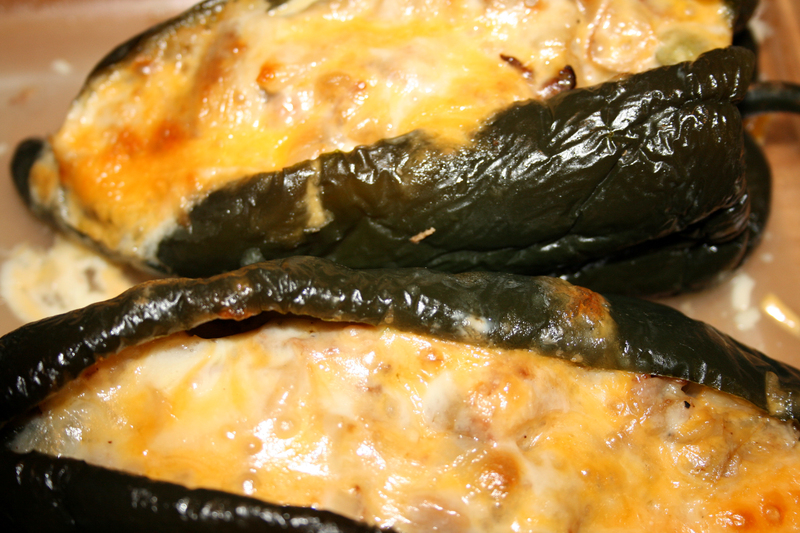 Top with a dollop of sour cream and a lime wedge for drizzling juice over the stuffed pepper. I began the month of March with potatoes and cabbage, now I end my mostly Irish theme here on St. Patrick’s Day with the same. How can I celebrate St. Patrick’s Day in America without corned beef and cabbage? I guess I can, but I won’t! Boil, boil and boil some more! I included directions for doing the cabbage separately (boiling or sauteing) because as usual it does not fit with the meat and veggies in the crock pot. You would think a 6 quart crock pot would be big enough, but not for us! We like our cabbage in bulk! I will return now to my celebration with family and friends. Happy St. Patrick’s Day! “May the road rise to meet you and the wind be always at your back. Pour water and spices into 5-6 quart crock pot. Add beef and cook on high for two hours, then turn to low. Add carrots and potatoes and cook for 4 to 6 more hours until vegetables are soft. Cut cabbage in half and remove core. Slice had lengthwise into wedges – enough to fit in one layer in a large pan with cover. To boil cabbage: about 45 minutes before meat is done pour enough water in the pan until it is about ½ inch deep. Add some salt and bring to a boil. Place cabbage wedges in the water, lower heat to simmer and cover. Cook for about 25 minutes until tender. Gently remove from pan with a long spatula, trying to keep the wedges intact. Salt and pepper to taste. To saute cabbage: about 30 minutes before meat is done heat large pan to medium high and add about 3 Tbsp butter. When melted spread it around the pan. Place wedges in pan and cook until browning begins. Flip wedges gently and let brown again. Cover pan and lower heat until cabbage is soft. Gently remove from pan to a serving dish, trying to keep the wedges intact. If they fall apart just go with the flow and make a pile. Salt and pepper to taste. Serve the corned beef and vegetables with spicy brown mustard, creamy horseradish and dense, crusty bread. It is March! March means two things to me – the world changes from brown to green and the 17th of the month is one of my favorite days of the year. 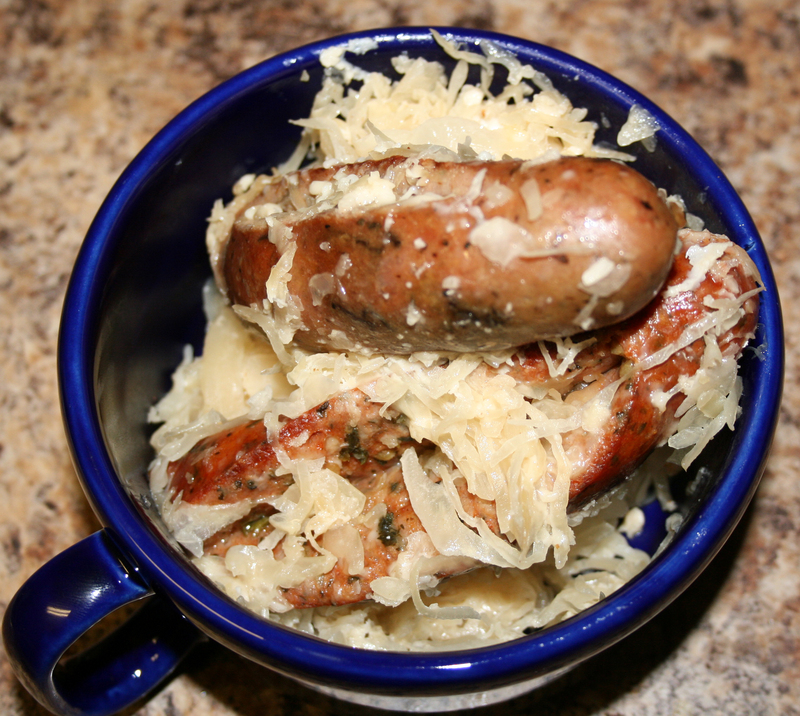 As St. Patrick’s Day nears I ponder more and more the Irish dishes I consider comfort food. Frankly, when I think of Ireland and food my thoughts do not often float beyond seafood and potato dishes. My ancestors survived on such things, so it is no wonder I enjoy exploring them. 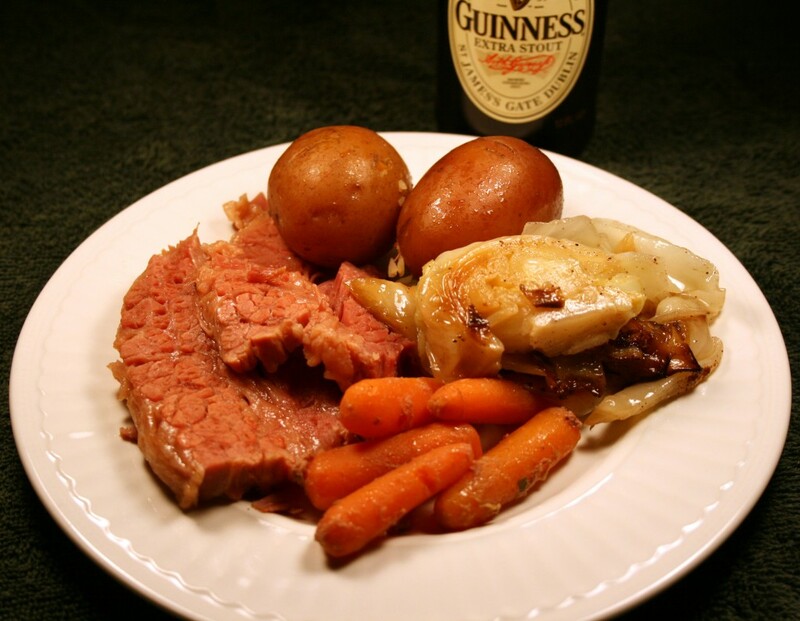 Traditional Irish-American foods that start popping up around St. Patrick’s Day usually include corned beef, but pork is more often the protein in Irish dishes. Over the next few posts leading up to St. Patty’s Day I am going to cover some of my favorite Irish dishes, prepared in ways my family enjoys them. Let’s see where this journey takes us! I am starting with colcannon, which goes well with pork. Go figure. One of my favorite pubs is The Lion and Rose British Restaurant and Pub, of which there are a few locations down in San Antonio and Austin, Texas. The first one opened in a little shopping center in Alamo Heights, an old neighborhood in San Antonio near my alma mater. So far they have retained the deliciousness of their food, and hopefully continue to do so as the number of locations grows. I mention the pub because they serve a dish I love, but for some reason rarely make – colcannon. Uh, technically their menu item is bubble and squeak (an English stove top version of colcannon), but the flavor is much the same and so easy to make myself. When I eat mashed potatoes there are usually vegetables along side and I always end up mixing them together. Mashed potatoes and corn? Mix. Mashed potatoes and peas? Mix. Mashed potatoes and green beans? Mix. Mashed potatoes and cabbage. Yep, mix. The traditional versions of colcannon I have come across include boiling. A lot of boiling. I can boil everything and mix it together as was done in the past, but I am partial to sauteed cabbage. The searing of cabbage that is barely crispy and just becoming tender makes me melt. I guess you can say I make a hybrid of colcannon and bubble and squeak. I am okay with that statement. If you are like me and serve colcannon with meat, at the last minute you suddenly worry that you forgot to make a vegetable for dinner. Never fear. 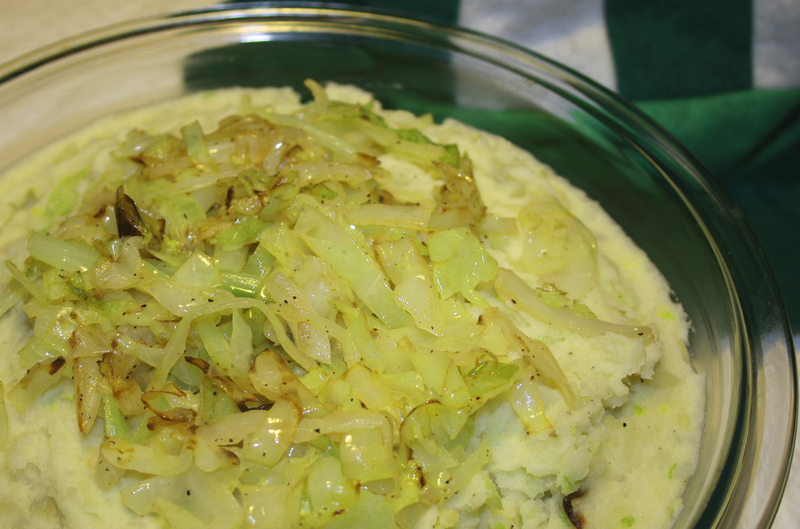 The cabbage IN the colcannon is actually the vegetable! Big D got a laugh out of my omigosh-I-forgot-the-veggies moment. Chop potatoes into equal sized pieces (about 4-6 pieces per potato). Drop potatoes into boiling salt water and cook until tender, about 20 minutes. Drain and set aside. While potatoes are cooking, core and thinly slice the cabbage. In a large skillet melt 1 Tbsp of the butter over medium high heat. Add cabbage and toss to distribute the butter. Turn down the heat to medium, add salt and pepper to taste and cover, cooking until cabbage is tender. 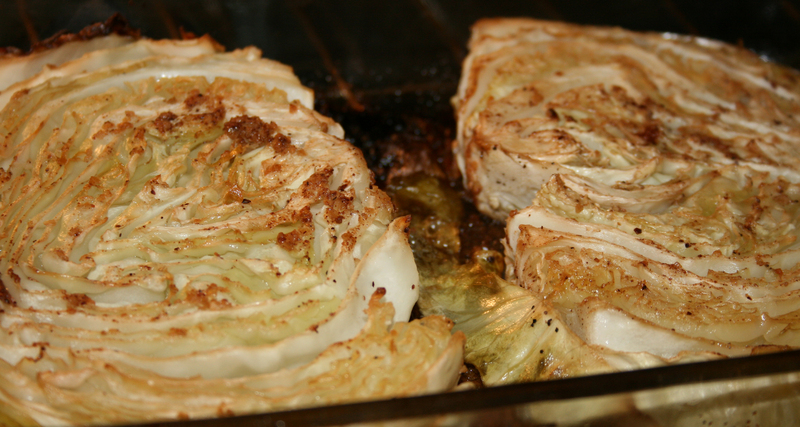 Occasionally toss the cabbage, allowing some browning to occur. While the cabbage is cooking add the remaining butter to a small sauce pan and melt. Add leek to butter and cook until transparent. Add milk and simmer until heated through, using salt and pepper to taste. Mash the potatoes until smooth (they may look dry). Add the onion mixture (the potatoes won’t look dry anymore). Add the cabbage, setting aside about one cup for garnish. Stir until all is combined. Top with the set aside cabbage. Serve hot.